Even though Mac did not win, he was honored during the in memoriam segment. Still, this did not go over well with Mac’s ex Ariana Grande. 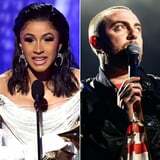 Following Cardi’s win, Ariana tweeted and quickly deleted “trash,” “f*ck,” and “literal bullsh*t.” Given that she’s friends with Nicki Minaj, fans immediately assumed she was throwing shade at Cardi (you know, because she and Nicki have beef), but Ariana later clarified that it had “nothing to do with her.” “She’s not at all and that’s not what I meant and u know that,” she tweeted. In another now-deleted tweet, Ariana explained that she was “very upset” that Mac lost after the Grammys invited his parents to the show. “This. This is what I meant. Karen was gonna have a green suit made,” Ariana wrote in response to a tweet. All of Ariana’s tweets relating to the incident have since been deleted.